To determine the accuracy of computed tomographic intravenous cholangiography (CT-IVC) for detection of choledocholithiasis. 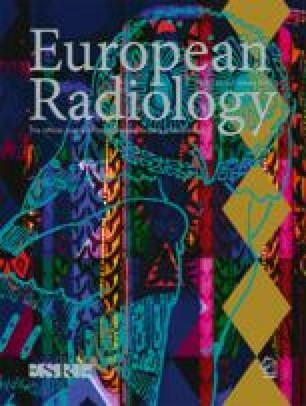 Sixty-five patients undergoing endoscopic retrograde cholangiography (ERC) underwent CT-IVC prior to ERC, using a single detector helical CT following intravenous infusion of 100 ml iotroxate. Patients with bilirubin levels >3 times normal were excluded. ERC was indeterminate in three patients (4.7%) and CT-IVC in four (6.3%). Twenty-three patients had ductal calculi at ERC, and CT-IVC was positive in 22, with two false positives and one false negative: sensitivity 95.6%, specificity 94.3%. Stones were multiple in nine and solitary in 14. Of the 14 solitary stones, ten were ≤5 mm and eight were ≤4 mm. The bilirubin level in positive cases was within normal in 20. Maximum intensity projection (MIP) reformats showed stones in only 27% of cases and surface rendered (SR) reformats in none. CT-IVC is highly accurate for detection of ductal calculi, including single small calculi, with a normal or near normal serum bilirubin. Axial images should be used for interpretation rather than MIP or SR reformats. Grants supporting this study were received from Royal Australian and New Zealand College of Radiologists; Schering, Berlin, Germany.